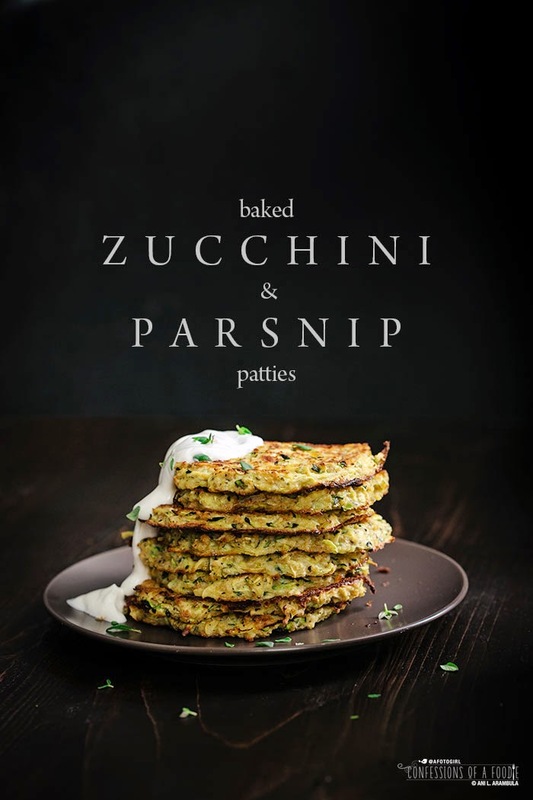 My version of zucchini patties are baked to make them more healthy and have parsnip to pack more nutrients and fiber into a serving. People love labels. Period. They like things defined. Catalogued. Orderly. Being somewhat of a Type-A personality myself, I can understand this. There is plenty I prefer to have clearly defined and catalogued so I can better understand. But the creative in me is also OK with a little ambiguity. Personal interpretation. Creative license. It puzzles me just as much as it puzzles others that these things can all live inside me, co-existing often times quite friendly-like. They want me to explain. Which of course, I can't. It just is. The other day, I had forgotten to take something in for lunch so I went to the cafeteria at work to see what they were serving. Normally, on days like this, I buy the made to serve daily salad but this day, I didn't like the daily offering. It had beets. And bleu cheese. I don't do either. The hot meal was a grilled chicken torta (a Mexican sandwich, with thick, baguette-like rolls called bolillos for those who don't know what a torta is). "Can I have a torta without the bread, please?" I asked the lunchroom chef who happened to be manning the line. "Excuse me?" She looked at me confused. So I repeated myself. "You want a torta without the bread? I don't understand." "I don't eat white flour products. I especially don't eat thick bread these days even if it was made out of whole wheat. So a torta, please, without the bread will be perfect." A very confused face stared back at me. "I don't understand." 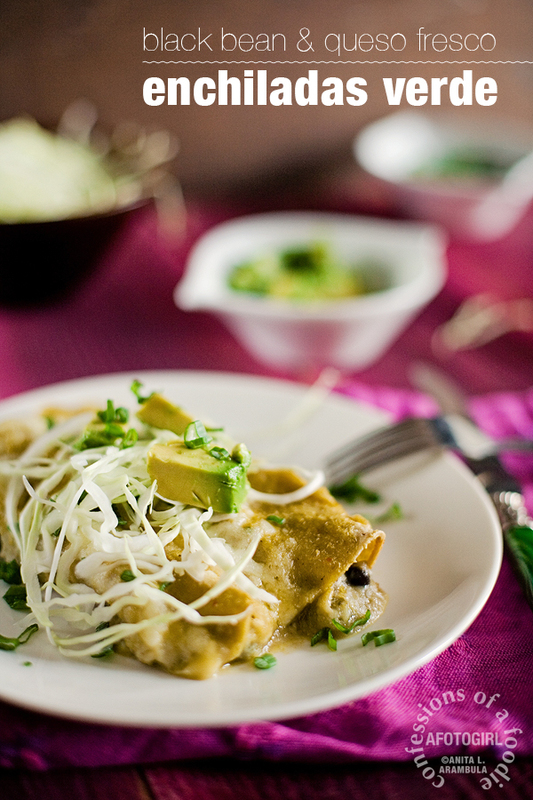 "Take a plate, smear a little beans directly on the plate instead of on the roll. Place the meat on top of the beans. Add the shredded lettuce. Place the sliced tomatoes on top of that then add an extra dollop of guacamole please since I'm not having the bread." I couldn't believe I was having to spell out how to basically make the sandwich she's been making all day minus the bread. "Well, Ok, it's your sandwich." Yes, yes it is. Thankyouverymuch. And yes, I realize I'm paying the same for it as if I were getting the bread. She hands me the "sandwich" and says, "So what? You're doing Paleo?" But I was not in the mood to try to explain that, too, so I simply answered, "Something like that." There is no one discipline I'm following in my quest to get healthy. Since my Type-2 diabetes diagnosis in late June, my subsequent research has lead me to many opposing schools of thought on how to manage, live with, or reverse the disease. As I shared before when I "came out" with my diagnosis, all I knew was that I had no intention of managing or living with this disease. I was bound and determined to reverse it and in the process, get control of my health again. My weight loss has slowed but I'm still losing. Currently I'm down 50 pounds since my June 20 wake-up call. My clothes are still getting looser. Even the ones I bragged here about buying back at the end of September. So I get asked a lot about how I am doing this. Am I Paleo? Am I Atkins? WeightWatchers? Nutri-System? Whole30? Taking weight loss supplements/herbs/potions that Dr. Oz talks about on his shows? I'm not exercising more than I did before. I'm actually eating more often. Maybe even the same amount of calories as before. I don't know for sure because I'm not counting them. I don't walk around all day with a calculator or iPhone app tracking every carb I put into my mouth. All I know is that quality of the calories and carbs I'm eating are much more nutrient dense and do not spike my blood sugar. What I am doing is eating mindfully. Choosing this over that. I eat whole foods, made from scratch when ever possible. I eat healthy fats like olive oil, avocados, cheese, yogurt, nuts, and seeds. I eat lots of low starch, high fiber or nutrient dense veggies, mostly dark green ones. I am eating animal protein like eggs, chicken (both thigh and breast), occasional steak, lean ground lamb, beef, turkey, or pork. Even whole grains like faro, barley, quinoa, short grain brown rice, rolled oats make an appearance on occasion as do slow glycemic loading flours like organic sprouted whole wheat, oat, quinoa, coconut, almond, cashew, walnut for those times I want a little sweet treat or want something "breaded". The key is unprocessed whenever possible. Jarred or canned goods must have no more than five ingredients (recognizable ingredients, not chemicals). Generally, the foods I eat fall below 9 on the glycemic load chart (most below 5) with a few here and there in the 10-12 range and even less frequent, 13-16 range. I eat smaller meals and more often (about every 2-3 hours). Some meals (or snacks) might seem counterintuitive because they are high in fat from butter, olive oil, cheese or nuts but I eat them to just shy of satiation and stay satisfied until it's time for my next meal. On October 30 I returned to my doctor who was pleased with my 45 pound loss at the time. She had blood drawn. On November 3 she called to congratulate me. In four months, I had reversed my diabetes moving my A1C from 6.6 to 5.5. All my numbers (except for my thyroid and vitamin D still in need of improvement) where now well within normal range. This doesn't mean I can go back to "normal." No, indeed. This is my new normal. 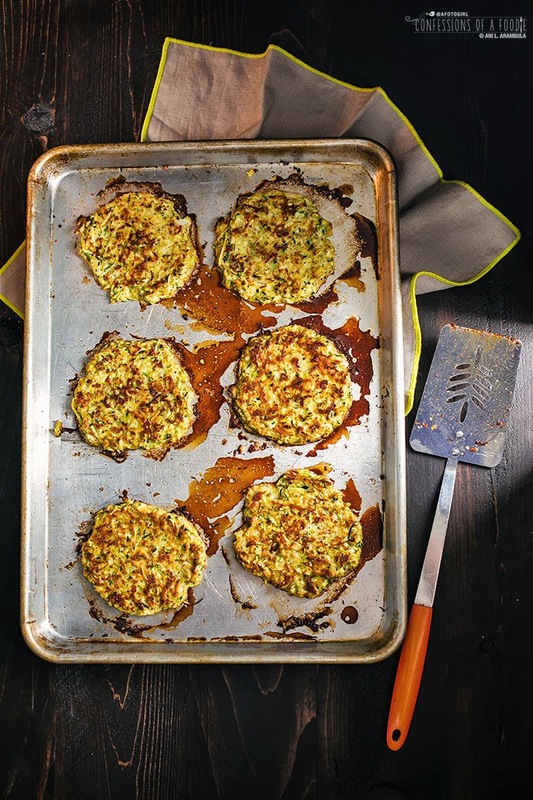 Meals like this Baked Zucchini and Parsnip Patties recipe is my new normal. I have 75 more pounds I would like to lose. Seeing food now as a way to heal my body, I have every confidence in the world that I will get there. 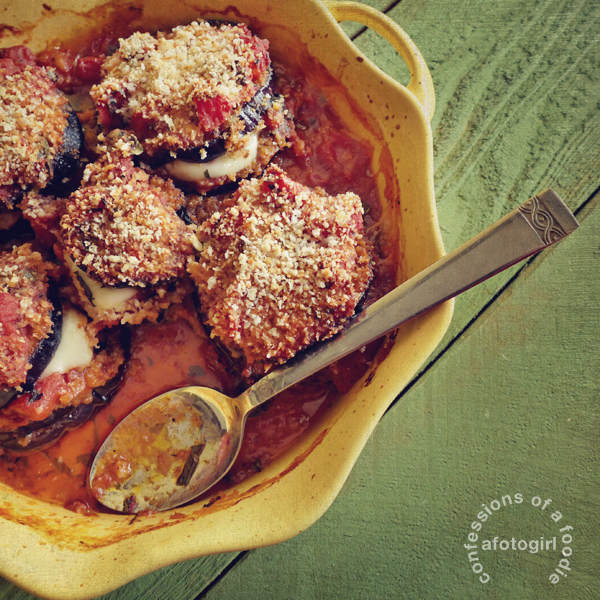 This dish was inspired by local food writer and recipe developer, Caron Golden. Caron writes for the newspaper I work at. Being the art director of the paper's Food section, I often get tasked with cooking, styling and art directing shoots for our food covers. 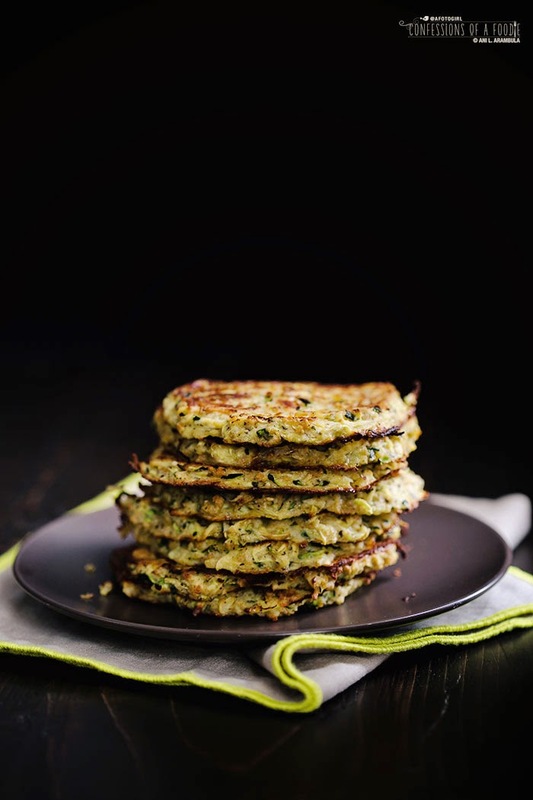 Caron did a series this year on Eating with Type 2 Diabetes and one of the first dishes we highlighted was a zucchini pancake. I made the recipe for the newspaper and was hooked. I've added parsnip to the recipe for some added fiber and nutrients. Parsnips are a higher glycemic food (52), however, they rate a very reasonable 4 on the glycemic load chart (a serving of russet potato, for comparison, rates 111 on the glycemic index and 33 on the glycemic load chart!). I also added parmesan for a salty richness. While Caron's recipe calls for frying the pancakes, I opted to bake mine. Although the fried version was totally delicious, I didn't enjoy standing at the stove babysitting them (took forever as I didn't want to fry more than two at a time to keep the oil from cooling down). My version is easier since it bypasses the frying making it more healthy. Before you get started, place the onion in the freezer for 10 minutes. This will help slow down the onion's emission of the tear-inducing enzyme while working with it. 1. Prep veggies: Slice zucchini in half lengthwise, then cut both slices in half. 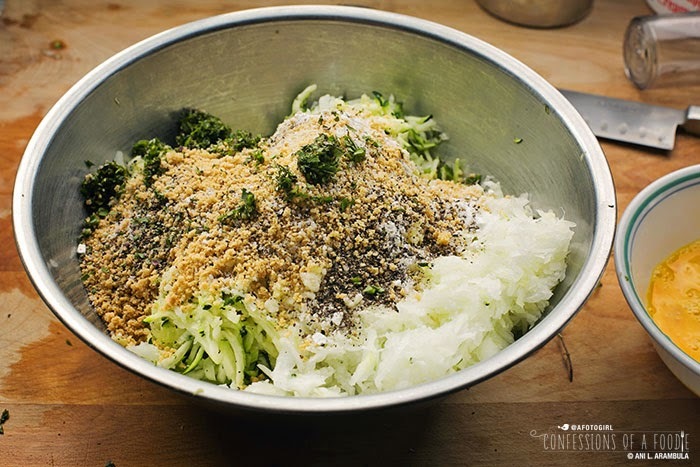 Put zucchini through a food processor with the cheese grater blade. 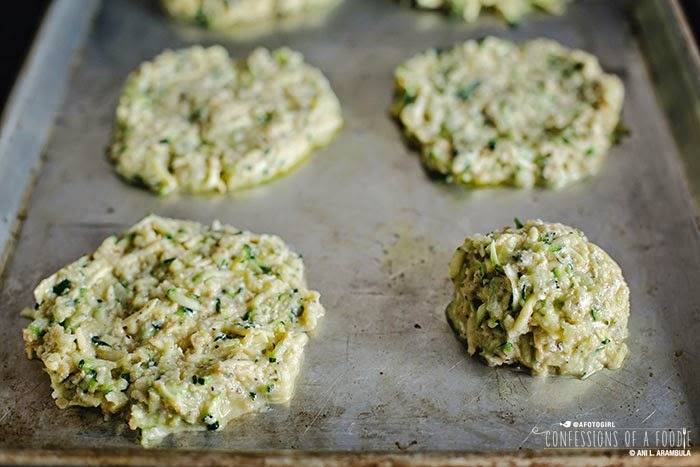 Alternately, leave zucchini whole and grate on the largest holes of a box grater. 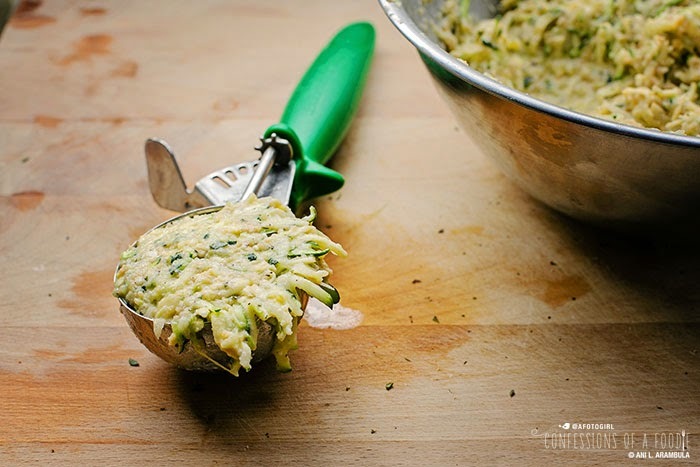 Place a strainer over a bowl and line the strainer with a thin dishtowel or cheese cloth; add the grated zucchini. Cut parsnip into thirds and grate in the food processor (or leave whole and box grate); add grated parsnip to strainer with zucchini. Grate the quartered onion in the food processor or the box grater; add to the strainer with the other vegetables. Gather up the towel and twist, squeezing out as much water from the vegetables as you can. Toss vegetables into a large bowl; set aside. 2. Preheat oven to 375 degrees Fahrenheit placing oven racks on top and bottom third of oven. Generously spray two sheet pans with cooking spray; set aside. 3. Finish batter: Add the cheese, panko, garlic, salt, baking powder, pepper, and minced herbs to the zucchini bowl, tossing well to combine. 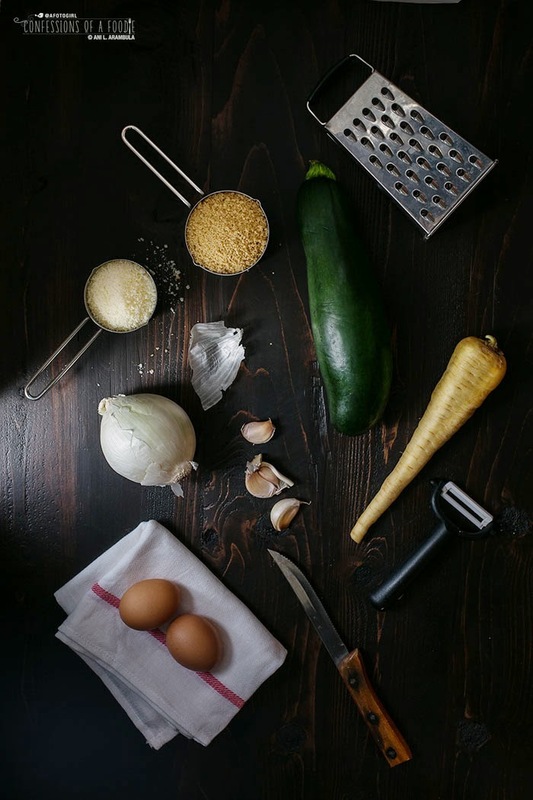 Crack one egg into a small bowl and beat lightly; add to zucchini bowl. Repeat with second egg. Stir well until all the ingredients are incorporated. 4. Bake: Using a ⅓ cup measuring cup or a 2 ½ ounce food scoop, scoop out some of the batter onto a prepared baking sheet, flatten into a round disk about 4 inches wide using the back of the measuring cup or food scoop. Repeat with remaining batter getting six patties on one sheet and four on the second. Spray patties with cooking spray. Place baking sheets in the oven and bake for 10 to 15 minutes or until egg is cooked and edges are golden. 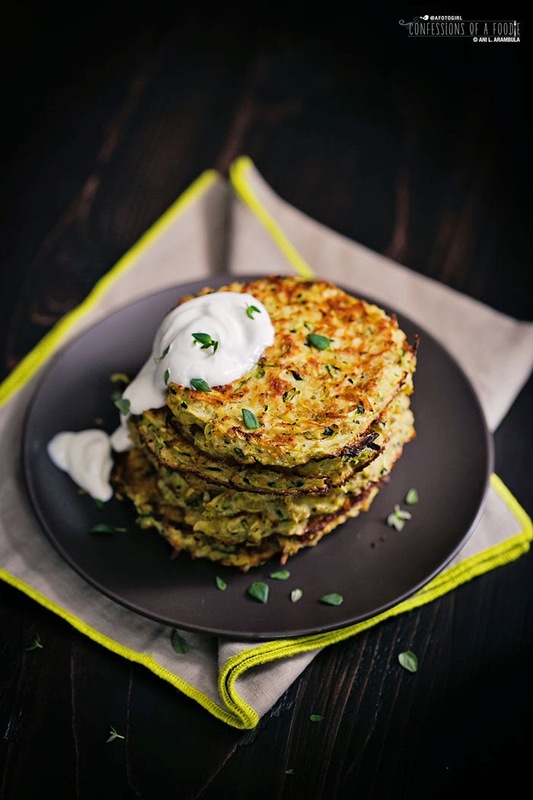 Serve immediately with a dollop of sour cream or Greek yogurt. Garnish with whole thyme leaves (optional). A side salad of arugula dressed with just a squeeze of lemon and a drizzle of olive oil completes this meal. 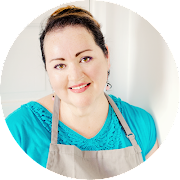 Ani, I continue to be so inspired and impressed by what you are doing and of course, your absolutely gorgeous food! I can't believe the server asked "So what? You're doing Paleo?" !! :O Hah...I would have flipped. :) Congrats on your healing journey with food! This looks gorgeous by the way! I've made this recipe twice now. Both times made delicious pancakes. The first time I followed the recipe strictly, with the exception of adding thyme instead of cilantro, as I was serving this under a steak with a cognac sauce and I thought thyme would fit better. The second time (last night), I followed the recipe except for the substitution of carrots from the farmer's market instead of parsnips, and served under flounder. Also delicious. Lesson learned? It's exhausting to grate the parsnips by hand! The second time I decided it was worth getting out my KitchenAid attachment. Much easier! What a great way to deliciously increase my veggie intake. Hi Calvin! So glad you liked this and yay! for trying it with different veggies. I've also made this with a sweet potato standing in for the parsnip and that was also delish. Thanks for coming back and letting me know how this turned out for you!